In a previous E-News article, we shared work that was being done to address the mental health of youth. Our Federation’s Jewish Teen Initiative has been working closely with the Jewish Education Project, which authored the article, as well as Mental Health First Aid to ensure our Jewish educators working with teens are better prepared to spot mental health issues of our youth. Our Jewish Teen Initiative convenes Jewish Educators monthly to ensure their professional development. This past year, the Jewish Teen Initiative offered two 8-hour trainings from the National Council on Behavioral Health that used role-playing and simulations to demonstrate how to offer initial help in a mental health crisis and connect persons to the appropriate professional, peer, social, and self-help care. The program taught the common risk factors and warning signs of specific types of illnesses like anxiety, depression, substance use, bipolar disorder, eating disorders, and schizophrenia. 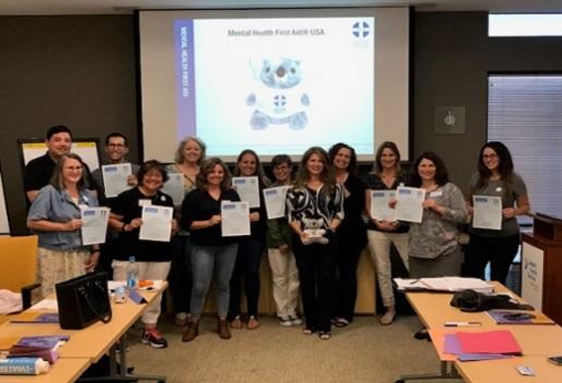 Like CPR, Mental Health First Aid prepares participants to interact with a person in crisis and connect the person with help. All trainees received a program manual to complement the course. Because of Federation’s investment in the Jewish Teen, 24 youth professionals representing 18 organizations in our San Diego Jewish community became certificated Youth Mental Health responders.